Iowa is where my childhood memories begin. So even though I wasn’t born in Iowa, the paradox is that I was. 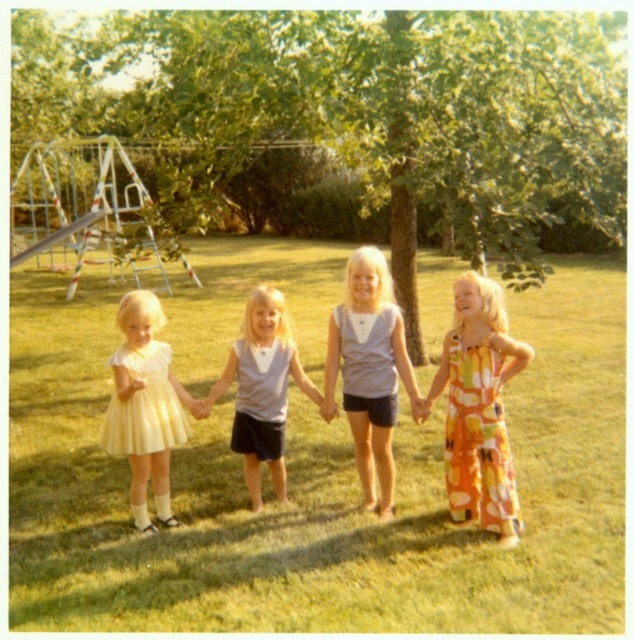 When I was five years old in Iowa, my world was my family and one block around. It was here I found my first best friend, and learned how to be one. I learned that if you’re shy, it’s good to have a friend who is just a little bolder. And maybe you help them be just a little calmer. Iowa first put music and rhythm in my body. My father used to play his guitar after dinner, while my siblings and I would move and dance around the living room. Soon I became aware of patterns. I noticed the steady beat of those songs was like the steady thump of a basketball in our driveway, or the steady creak of metal chains as our swings went back and forth, back and forth. Iowa is where I first felt the range of my emotions. I felt compassion when my little sister had her tonsils out. I felt disappointment being chosen last in kindergarten to select a Christmas gift. (Adding salt to the wound, it was a giant pencil … a pencil!) I felt tenderness and affection for our sweet, elderly babysitter. And I felt afraid when my friend’s parents took me for a long drive away from home. I didn’t know why I was separated, and I cried for my mom. That’s me, second from the right, holding the hand of my fabulously bold friend, Wanda. But in Iowa, I also learned to take risks and knocks and be resilient. One time I hit the curb too hard, flew over my bicycle handlebars, and crashed into the pavement. Another time I slipped down the basement stairs and broke my collar bone. All the scars I have on my knees, I earned in Iowa. Iowa also put a gentleness in me. Iowa is where I first felt the warmth of the golden hour, watching summer shadows stretch long on the sidewalk. I learned that backyards full of dandelions turned into fields of wishes. That we should make love, not war. And that there were people walking on the moon, though you couldn’t see them. This is why you must always have dreams, to find just what is possible. …Iowa has a safe, kindly, fresh-scrubbed feeling. The landscape consists of miles and miles of rolling, undulating green, a verdant patchwork of corn and soybeans, the horizon only broken every once in a while by a clump of farm buildings — a large white house, a sagging red barn, a windmill, a silo, a couple of sheds — and sometimes, out in the cornfields, by a pickup truck barreling along a narrow road in the distance, kicking up a cloud of white dust. Often on the horizon the air fades to a pale, hazy, bluish shade of pink, and above it the vault of the mild blue sky curves and rises. The view seems endlessly wide; it makes something expand inside your eyes or your mind. This is true. This is what Iowa first did for me. It made my life expand.